An elderly woman, believed to be in her 60s, was found with her throat slit at a residence in Lanbury Place, Eastbury, Phoenix, a short while ago. The suspect, the victim’s husband, has handed himself over to Phoenix police. “The door was locked and in a desperate attempt to reach the stab victim I broke down the door and found the elderly woman on the bed with her throat slit. I attempted to find a pulse but to no avail. KZN VIP Response and Medics were quickly on scene and upon assessing the victim, KZN VIP medics found that she was deceased. The murder weapon, what appeared to be some sort of meat cleaver, was on scene. The victim was lifeless on her bed,” said Naidoo. Phoenix SAPS took over the investigation and it is alleged that the suspect handed himself over to police. 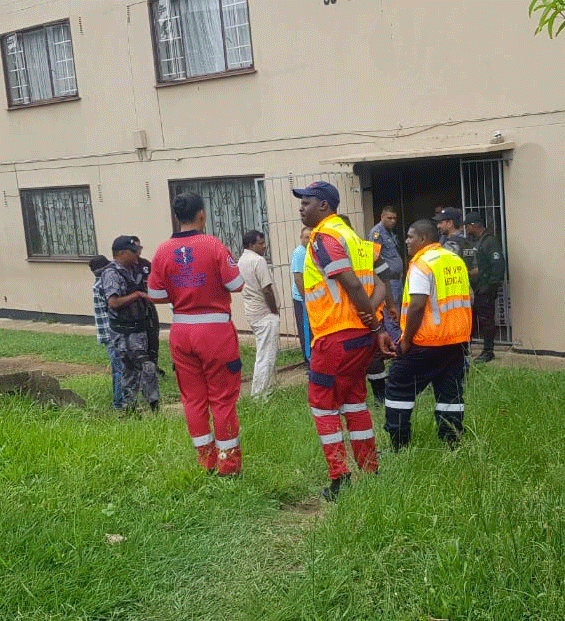 “Whilst on scene, neighbours and locals shared that the man has for a few days stated that he intends killing his wife and himself. No one paid attention and there was no intervention. Tragically, now a woman is dead. I urge anyone who is confronted by such claims to intervene and try and save a life in this way. Cries for help come in different forms. Don’t turn a deaf ear as sometimes it is too late,” said Naidoo.